Like us, monkeys are social primates. Therefore, living with at least one other monkey is ideal for their wellbeing and encourages natural behaviors. Our goal at Primates Incorporated is for the monkeys to be able to live as much like wild monkeys as possible, so forming pairs or groups to live in the same enclosure (also known as socialization) is a priority for us. Just as humans get along with some people but not others, monkeys will find some monkeys to be friends while others will be foes. In fact, in many cases, putting monkeys in the same enclosure without first analyzing compatibility and social cues can lead to serious fighting and injury. This is especially the case with rhesus monkeys. We take pride in reporting that four of our six monkeys are now socialized! It has been incredibly rewarding to see the positive changes that have resulted from these socializations. Early on, as reported in Trio Success! we could see that River was particularly eager for companionship. He flourished once socialized with Batman and Timon. We continued to watch the interactions between monkeys to determine any future pairings. Mars and Batman showed interest and affiliative (ie. friendly) behavior such as lip-smacking toward each other. Thus, we took the steps to give them initially limited and gradually closer contact with each other to see how they would react. This increasing contact would also help them sort out their dominance hierarchy, which occurs naturally in rhesus monkeys, before they had full contact with one another. The actual pairing with full access to one another could not have gone better! When we gave Mars and Batman full access to one another in the same enclosure, Batman immediately fear-grimaced toward Mars, showing his submission to Mars. There was no aggression between them, while we witnessed affiliative behaviors such as lip smacking and presenting to be groomed – and by the next day, they had already shared a friendly grooming session. We observed immediate positive changes in Mars’ behavior and Batman has been content that Mars has been such a calm dominant monkey. We are hopeful that incoming retirees will make good matches for Izzle and for Bella! 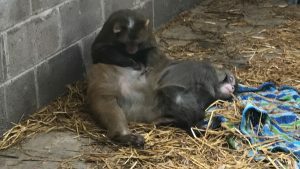 In the meantime they are enjoying safe grooming interactions from their caretakers as well as the sights and sounds of the other primates in the building. We are making steps towards formally sharing our socialization processes and look forward to Primatologist, Hilary H.Kavanaugh presenting these methods and results at the Animal Behavior Society conference in Chicago, IL July 24th-27th. Please stay tuned for a sneak peak of these results in the upcoming months! If you would like stay informed of developments at our sanctuary please sign up on our email list at the bottom of our website page. Thank you!